“My experience with Rosensteel Fleishman was, in a word, outstanding. After my accident, Mr. Fleishman and his staff exceeded my expectations, and got me the maximum amount money that I was owed by the insurance company. They were thorough, efficient and professional. “Doing business whith Rosensteel Fleishman, PLLC for 10 years was always a pleasure. They were always here for us with all legal assistance we needed. Thank you and we will continue to do business with you." “Could not have asked for a better outcome with my traffic ticket. Very professional firm and staff. I would recommend Rosensteel to anybody with a traffic citation." "I hired Corey Rosensteel for a DWI that happened in August 2013. The case was dismissed in May 2014. Apparently, his litigation skills and knowledge were well known by the D.A. and assistant D.A.s. His fee was extremely reasonable and his staff are a delight. They are extremely knowledgeable, helpful, and most of all friendly and genuine. I would highly recommend Rosensteel Fleishman to anyone who asked me." “I recently received a traffic citation that was becoming very time consuming and costly. Mr. Rosensteel was able to secure a voluntary dismissal of my case without incurring any court costs, and more importantly avoiding any time off of work! Mr. Rosensteel and his assosiates have been very professional and a pleasure to work with from start to finish. I would highly recommend them to any friends or family that may need legal assistance." “I had a serious speeding ticket driving around Charlotte and was very concerned with driving points and subsequent insurance problems. Mr. Rosensteel's staff and paralegal were the first to connect with me. Pat took her time explaining all my options and collecting all the documents. Mr. Rosensteel represented me and must have presented a compelling argument. My case was closed with much better results than expected, and my driving record remains clean. I was very impressed with the results and dealing with this firm will make you feel comfortable and you will get all the attention that you feel you need. I strongly recommend them to anyone with these kind of legal issues." “Matt Fleishman and staff were great to work with during my case. A local attorney in the Pittsburgh, PA/Weirton, WV area recommended them to me. A driver who had Allstate hit me from the rear in Charlotte during a business trip. Although late to the game, Matt and his staff put the time in to learn the details of the case, were efficient and very thorough. Matt realized that I was in a situation out of my comfort zone, so he and his staff demonstrated a level of patience and understanding that was quick to put me at ease. Matt worked through the existing file (inches thick), and communicated with Allstate (at their pace), until a resolution was reached. Drawing from his experience was invaluable." “I recently received a minor traffic citation that was turning into a huge headache. Mr. Rosensteel was able to secure a voluntary dismissal of my case without incurring any court costs, and more importantly avoiding any time off of work! Rosensteel Fleishman has been very professional and a pleasure to work with from start to finish. I would highly recommend them to any friends or family that may need legal assistance." "My wife and I were involved in an accident in March of 2013. We were hit while crossing an intersection and our car rolled onto its roof. We contacted Matt in the couple days after the incident and were very pleased with his counsel. He advised us on how to handle our situation and we were very pleased with the result after our case was settled. Additionally, his staff, particularly Tori, worked very hard on making sure we had transportation and that our property damage claim was handled appropriately. I recommend Matt to anyone who has been in an accident with bodily injury. He'll make sure you're matter is handled well and will make sure that you understand what is happening every step of the way." " I am very pleased with my experience with Corey Rosensteel and his team (Pat Hicks & Jen Park). After being pulled over for speeding and then arrested for DUI, I thought there was no way out of it. 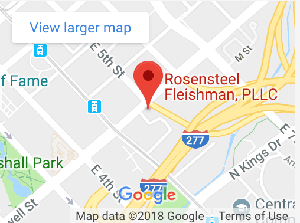 I saw a review online that looked similar to my own situation and decided to call Rosensteel Fleishman. Just 20 minutes into my conversation with Corey I felt so much better and knew there was a glimmer of hope. Corey, explained to me all the possibilities, the good and the bad. He then assured me that would be the last time we would talk about a guilty verdict. Corey is such a kind hearted man, after explaining that I was going through a financial hardship he decided to lower his cost to help me out. If your situation sound like this (blew a .10 on the side of the road and a .09 in jail. Had no problem doing any of the road side test and actually thought I passed with ease. But was still arrested.) I recommend you call. Thanks to Corey and his team I was found not guilty of the DUI. Somebody even asked me outside of court, "Did you just get out of a DUI? That's hard to do!" Again, if this sounds like you I encourage you to call, and know there is hope with Corey Rosensteel, Pat Hicks, and Jen Park on the case." "I was injured in a vehicle accident through no fault of my own. The other driver struck me while I was riding my motorcycle. Luckily I didn't sustain lasting injuries and the driver admitted fault to the incident. I was however left in an intense fog and unable to handle the insurance company on my own. Also because I work in an automotive shop I knew my injuries would keep me from working for many weeks. At first I was going to attempt dealing with the insurance company on my own, but I quickly realized I would be unable to represent myself well enough to get what I needed to be well again. I had thought about using other firms that use a lot of advertising or say they specialize in motorcycle accidents but my wife found Rosensteel Fleishman and decided they would be the best firm for us. Boy was she right! The insurance company that we had to deal with dropped the ball so many times one both the property damage claim and personal injury claim. Luckily the staff at Rosensteel Fleishman were always professional and had my best interests in mind from start to end. Matt Fleishman explained everything to us through all the most important steps and informed me of what our options were and took the time to explain each one. Mr. Fleishman and his paralegal assistant Tory worked very hard for us and always had an answer for every question even though the insurance company was using unorthodox tactics. If you are in a similar situation, believe me you can trust Rosensteel Fleishman." personal injury incident. I ve never met such a honest, dedicated and committed individual as Mr. Fleishman. He put my mind at ease immediately. The whole staff was extremely helpful and courteous. I would highly recommend this law firm to anyone who needs expert representation! Thank you again Mr. Fleishman. "Rosensteel Fleishman is a best option choice for legal counsel in their specialized arenas of law. I was expertly represented by Mr. Rosensteel over 6 years ago for some very fearful driving charges that were avoided due to his diligent and professional legal execution. I recently re-engaged his insightful advice for other legal concerns and found the same level of valuable knowledge and direction. I cannot fully relate the respectful, efficient, and smart interactions that I find with this attorney and his firm. I highly recommend Corey and what he does in his field." "Rosensteel Fleishman, PLLC repersented me in my personal injury auto accident case. Attorney Matthew Fleishman and his Paralegal Victoria Johnson were there for me from the minute I called for their services. My case was what would seem to be pretty cut and dry as I was " T- boned" by an SUV driving without it's headlights at night time. I had a witness testify the same thing. The other driver's insurance company did not want to offer anything more to me than my medical bills. Nothing for pain and suffering, loss of work, etc. The insurance company instead of offering any more to settle went to trial were they were trying to have a jury find me in contributory negligence. In other words if the accident that happened was proven or believed to be even 1% my fault then I would be on the hook for all the expenses and the insurance company would walk away expense free. I went through surgery , had doctor bills, vehicle damage, lawyer and other fees that were mine until judgement would be made. Attorney Matthew Fleishman won my case and did it exceeded any expectations I had. He had the witnesses, expert witnesses in place and a game plan to go by. The amount I received for my judgement was outstanding not only due to his ability to perform in front of a jury in the Mecklenburg County Court House in Uptown Charlotte , North Carolina but also because of his own rule "He never takes more than his client gets in the end". Thank you Attorney Fleishman." "After going 10 years without a ticket, I managed to get 2 speeding tickets in 10 months. Even though my first one was outside of Rosensteel Fleishman's coverage area, I still turned to them first and they were able to give me a great referral to a lawyer in the area where I got my ticket and it was handled quickly and professionally. I walked away with just an improper equipment which carried no points on my license or on my insurance. Then when I got a local speeding tickets 10 months later, Corey Rosensteel was happy to handle this one for me and glad he could help out. After I left a voicemail for his team, I had an email, forms and all the steps quickly laid out for what I needed to do to have them represent me. Within 2 business days after my court date and without any follow-up on my behalf, I had an email from Mr. Rosensteel's staff informing me that he was able to secure another improper equipment charge which is the best outcome possible outside of a dismissal. Again I had no points on my license or insurance. Rosensteel Fleishman were there for me when I needed them and I owe them many thanks for taking care of my situation in such a timely and efficient manner. I would highly recommend them to any of my friends, family or colleagues." "The first attorney I contacted was one of the many who sent me a flyer or letter after I was hit by a car. That attorney's assistant did not even put my call through when I told her I thought I had only soft tissue damage. So I looked and found Matthew Fleishman. That was one of the best phone calls I've ever made! My call was put right through to him. Attorney M. Fleishman urged me to keep seeing a doctor when my pain persisted and he was so right. I ended up having 2 surgeries as a result of that wreck. He was patient and always returned my calls. He worked hard on my behalf. I was very happy with his level of service and the compensation I received for my injuries. " "Mr. Matthew Fleishman and his staff were excellent. They really took their time and explained every step to me and my niece regarding my case. Everything that he said he would and could do was done with efficiency and tact. If ever I need an attorney to help me or any one of my family members I will be calling Mr. Fleishman and his team. Many Regards & Be Blessed"
"I have never met a more thorough and intelligent lawyer in my life. Corey and Matt, as well as their hardworking paralegal Pat Hicks are truly a pleasure to work with anytime that you need an attorney. I have used them twice in Mecklenburg county and they have EXCEEDED my expectations on the outcome of my traffic cases, resulting in complete dismissals. Most attorneys will over charge you, promise the world, and then leave you out to dry after soaking up every dollar in your wallet. These guys are honest, and believe it or not, AFFORDABLE! I found their pricing to be very fair, a rarity when dealing with most private attorneys. They truly are a relief, go the extra mile to help you out, and research/explore several methods of taking on your case. Every time I have hired Matt or Corey, they've produced BETTER than expected results. I am more than happy with these guys. I am proud to be a client, and I tell everyone I know about them. Once you give them a chance to represent you, you wont regret it. Just give them and a chance and you will be happy with your outcome as well." "The A.M. family has used the Rosensteel Fleishman law firm on multiple occasions. We have never worked with a more thoughtful and dedicated staff, always available to answer any questions or concerns. Their expertise and knowledge made a profound impact on my family. We will forever be grateful to the Rosensteel Fleishman law firm. We wish them much success in all their future endeavors." "I do not want anyone to be in the DWI situation I was in, but if you are, have the best lawyer in Charlotte on your side and call Cory Rosensteel. I can not be more pleased with how Mr. Rosensteel handled my DWI case. I was driving home and pulled over for having a faulty tag light. After performing the field sobriety test, I blew just over the legal limit. Mr. Rosensteel laid everything out on the table and really put me at ease with a very troubling situation. I was scared and down right mad at myself for getting into this situation and he constantly reassured me that everything would be alright and he would take care of everything. When we went to court, once again he laid out my options and I trusted his judgement completely. We went to trail and he got the case dismissed. One of the best decisions I have ever made was to call Rosensteel Fleishman." "Thank you I called 3 or 4 lawyers around Charlotte and they were the only ones who took the time to answer all of my questions and explained how each result would affect my license and insurance. I had used another lawyer in the past and I could never get him on the phone or return my call. This firm did and they get me a great result. I would definitely recommend them." "Rosensteel Fleishman, PLLC repersented me in my personal injury auto accident case and traffic citation. Attorney Matthew Fleishman and his Paralegal Tory Johnson were there for me from the minute I called for their services. The Rosensteel Fleishman, PLLC team was outstanding and guided me through every step of the process for a successful outcome in the resolution of my case." "I would like to give thanks and extend my appreciation to Mr. Matthew Fleishman for his devotion in presenting my son, Brent Rodgers’ Mediation case, in 2006. I was so impressed with how he demonstrated such professionalism and grace and in the end all parties involved were satisfied. I will always be grateful and I feel really good about referring others to you because of a job WELL DONE.!!! You will always be my Attorney. Again, thank you and I sincerely wish you, your family and your firm a healthy, wealthy and most prosperous New Year." "I would like to take the time to thank each and every one of you for your outstanding service. The communication from the start was top notch and the customer service was world class. I would gladly recommend your firm to family and friends in the surrounding area. I am extremely pleased with my choice of firms. From the first call when I spoke with Corey to the follow up emails and phone calls I received from Pat and Cally, I am astonished how smooth you guys made this for me and I am forever grateful. I would be more than happy to complete a customer satisfaction survey or write a review on your website. Thank you all again for your hard work and should the need arise again your firm will be the first and only call I make." "I was involved in an accident with an automobile while riding my bicycle. After being rejected by three "prominent" attorneys in Charlotte I fortunately contacted Matthew Fleishman. After reviewing the evidence Mr. Fleishman immediately took my case and filed a lawsuit. I found him to be consistently honest, factual, and to the point. Because of his integrity, knowledge of the law, and excellent presentation of the case, the lawsuit was settled in my favor and complete satisfaction in four months. I strongly recommend Matthew Fleishman to anyone who may have a legal problem." Mr Rosensteel is a top rate attorney, bar none. Not only is he courteous and professional, but he is also tenacious, thorough and committed to his clients. My case was unique, but through Mr Rosensteel's in depth research, he was able to site some Appellate Court cases that were beneficial to my case. He presented these findings to the judge and was able to have my case dismissed based on his findings. I could not have wished for better representation. Corey Rosensteel is an exceptional attorney and I will be recommending him to all of my friends, co-workers and to anyone who asks! "Matthew Fleishman is a consummate professional and gentleman. His skills are clearly reflected in the positive results he produced. Moreover, he shows keen insight into the human element, keeping me informed of his progress and important events. A true advocate, Mr. Fleishman listens carefully, offers expert opinion, presents clear options and works tirelessly. I would surely use him again and recommend him highly." "Matthew Fleishman handled my medical malpractice claim. He was extremely kind, patient, and professional. Matthew is definitely someone you would feel comfortable calling in your time of need. I have and will continue to recommend him to anyone who is looking for legal representation." "Couldn't Be More Pleased! I am new to the Charlotte area and was involved in an incident in the downtown area where I was charged with a DWI. From talking with locals and friends in the area, I thought all hope was lost on winning my case in Mecklenburg county. I talked to many lawyers on the phone and a couple of in-house interviews and was told everything under the sun. When I got in touch with Corey and interviewed with him, I finally felt someone was at least being upfront with what I was facing. He seemed knowledgable of the process and told me the best and worst case scenarios. This type of communication is key in choosing the right representation. And when we took the case to trial, we both came out victorious even though we were both skeptical due to the circumstances. His articulation of the circumstantial really won this case in the face of adversity. To this, I am forever indebted and will continue to give nothing but praise and recommendations!" "Very Pleased I offered to write this review as a result of the abilities that Corey demonstrated. After getting charged for a DWI, I sought out a few legal opinions. I spoke with one attorney who offered no hope for a fight and was still looking for good $$. I then came across Corey. If I was impressed with his background from the web-site, I was blown away upon speaking with him. Each and every contact from that point on, Corey had the intensity that I needed to win this case. During each court date, he was well prepared and had a plan based on the judge who was scheduled to be on the bench that day. In addition to knowing the laws (which he obviously did) but he also knew how to maneuver throughout the court system which was a huge advantage to me in this case. Long story short, we had four points which we thought we had a good fight on, the judge dismissed the case after hearing only two. It really wasn't even fair. Glad to say. Bob L from Matthews"
"I am very pleased with the professionalism, courtesy and timely response to my accident claim. I will certainly use Matt Fleishman's services if the need arises in the future." "Mr. Rosensteel is by far the most professional and personable attorney I have dealt with. I was accused of DUI in Mecklenburg County and Mr. Rosensteel was able to get all charges dropped. Other lawyers gave me the run around, did not return calls, and charged ridiculous amounts for the simplest consultation. His skill, work ethic, and professionalism not only removed these accusations from my record but eased my nerves throughout the entire process. If you are looking for a great lawyer at reasonable price...look no further." "Overall, I couldn't be more satisfied with how I was treated by the Rosensteel, Fleishman Law Practice. The level of professionalism and knowledge of our law system is far better than the competition. If you are looking for someone to take on your case as if it were theirs, look no further. As far as cost, its money well spent. They are flexible with your schedule and are always available. I never had any issues with, nor complaints about, the front desk. It really felt like a family atmosphere. Communication is unbelievable, and I never had any doubt that I was in the best hands I could have been in. This practice completely exceeded my expectations." "I'm highly satisfied with the services of Mr. Fleishman! He went all the way to get me the best compensation possible and truly exceeded all of my expectations. Thank you!" "I utilized Rosensteel Fleishman's services in the past. I had a traffic violation and the firm handled my case in a very courteous and professional manner. They are very effective. My case was resolved quickly and I would definitely recommend them to any of my friends and relatives." "I have never dealt with anyone as professional as Mr. Matt Fleishman. He is truly an attorney that wants the best service for his client...If I ever need an attorney again Matt Fleishman is the only one I would think to call. Thanks Matt you made me and my family very happy." "Attorney Fleishman was a great relief to me and my family when he personally took over my car accident case. He was inspirational, detailed, professional, engaging, understanding, hardworking, thorough, and I received a huge settlement. So I thank attorney Fleishman from the bottom of my heart - forever; he helped to change my life." "In the future I'll personally recommend Mr. Fleishman to anyone who is in need of representation. The office staff is very friendly, helpful in all areas of concern and is sympathetic to the needs of their clients. Mr. Fleishman went above and beyond to assist me. He answered all of my questions and did not rush through my phone calls. He listened to my questions and answered them in lay terms. I was also very pleased with the courteous service received by the office staff and will continue to use their services in the future. Great Lawyer - Great advice Thank you"
"Rosensteel Fleishman did a great job at representing me in Circuit Court and I am happy to recommend them to others in need of a top notch attorney"
"I found Matthew Fleishman to be a nice and polite young man who always conducted himself in a very professional manner. My calls were returned promptly and he never made me feel as if I was being rushed to finish the conversation. He made me feel as if I was the only client he had, even though I realize that was not the case. He listened to my comments, concerns, and questions, as well as those of my sons, with compassion for our loss of a husband and father. Matthew took a personal interest in my family. He was there for my tears, my fears and my frustrations. My case settled to my satisfaction due to his expertise and uncompromising dedication. I have and will continue to recommend Matthew to anyone who finds themselves in the same malpractice situation I was placed in." "I give a huge thanks to Mr. Rosensteel, He made my case a breeze with no worries. He handled everything for me did an amazing job, got exactly what we were hoping for. A big thanks from me and my family. Highly recommend for any matter. Best attorney i have had by far. A++++"
"Rosensteel is an amazing firm to work with, they made my court experience a peice of cake. I was dreading the situation for months and I was unsure exactly what to do. Pat Hicks provided excellent accurate information on my wreckless driving and no motorcycle license charge. Unlike other firms they were sure about there information and did not just tell me the things I would like to hear. They appeared for me once and continued my case because they thought they had a chance to get it completely dropped, most other firms wanted to simply offer me the prayer for judgement offer. They continued my case and long and behold everything was completely dropped. Not to mention if you ever have to appear at court they allow you to park at their facility next to the court house which is in walking distance. You do not have to pay for parking or deal with the hastle of it and on top of that they are with you from start to finish to answer any question or provide any detailed information I needed. Thanks a lot and if I ever have any future issues you will be the first place I call!" "Mr. Rosensteel impressed me with his professionalism, dedication, and courtesy. He is not only a great person but also a great Traffic Attorney who is very courteous, understanding, and thorough. His paralegals Tory Bryant and Pat Hicks were very detailed, hardworking, and most importantly patient with me. I am very satisfied with the Rosensteel Fleishman Firm. I would surely use them again and I highly recommend them to anyone in need of their services." "I am very happy to post this review about Matt Fleishman and his team! After my accident it was a very stressful time for me physically and and emotionally. From the first meeting with Matt i knew that i was in good hands. I am very pleased with the outcome of my case and the settlement received. Leaving no stone unturned and excellent service, hands down Matt Fleishman and his team at Rosensteel Fleishman come highly recommended from me. To those dropping by and reading this i will say "You have come to the right place." So...Thanks to you Matt and your team at Rosensteel Fleishman....."
"Cory Rosensteel and Pat Hicks were simply amazing. Diligent, professional, and experienced. If you need an attorney I would sincerely recommend you hire Mr. Rosensteel. Great job and a pleasure to work with!" " Two summers ago I was involved in an accident. I was hit by a car, while walking and knocked off a bridge. I spent the night in the hospital but was blessed without serious injuries. However, multiple insurance companies were involved making the situation well over my head. After reviewing attorneys in the area, I decided to go with Rosensteel Fleishman PLLC. Mr. Fleishman was recommended by friends of the family and did not disappoint. He was prompt with his communication, and I appreciated him taking the time to make sure I understood what was going on, breaking down the details of the case and thoroughly answering all my questions. I also appreciated his advice, describing my options, rather than pushing me towards any one decision. Mr. Fleishmann knows his material, and is always well prepared. The same goes for his staff. Over all I was very pleased with how they handled me as their client. My goal was to have the settlement cover my medical bills, and working with Rosensteel Fleishman PLLC, the bills were covered and more. Mr. Fleishman stood by his promise to never take more than his client receives, and that only added to his credible reputation. I recommend Rosensteel Fleishman PLLC to anyone with a personal injury claim. " " Corey Rosensteel and his Paralegal team with Pat and Jen are the very best! Always available to talk on the phone, very efficient in gathering needed documentation, easy to work with and most importantly of all, Corey has the relationships with the local District Attorneys needed to put his client's cases in the very best possible light for a given situation. I could not be more pleased and will always recommend this firm to any family and friend who need his services." "Mr. Fleishman represented my daughter when she was struck by an automobile and we are very pleased with his expertise. He was patient, through and extremely professional. I would recommend him to anyone and will assure you that your in great hands."